Angus MacGyver (Richard Dean Anderson) is a secret agent, first for the U.S. government and then, for the top-secret Phoenix Foundation. 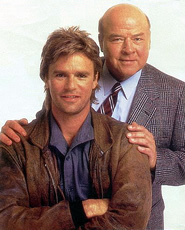 MacGyver’s boss and best friend is Pete Thornton (Dana Elcar). MacGyver is a unique action hero in that he prefers to use his ingenuity to solve problems rather than resorting to violence. Whenever he’s caught in a life-or-death situation, he’ll use ordinary household items to escape and save the day. MacGYVER IS ONE OF MY MOST FAVE TV SHOWS I LOVE RICHARD DEAN ANDERSON HES SO COOL HANDSOME AND ALL THAT AND A BAG A CHIPS AND I HAVE THE T-SHIRT! mac gyver you are my angel i think a bout you really a lot love susan verre . I NEED Some Photos and episode of you mac gyver to let me know al bout mac gyer love your angel susan verre. you look very handsome on the show is mac gyver.